As the breeding season draws to a close, so the hundreds of dedicated ringers who run the 120 Constant Effort Sites (CES) scattered across Britain and Ireland can start to relax and recuperate after a summer of early morning starts. As they use the same mist nets in the same places each year to catch the birds, the information they collect tells us about changes in numbers of adults and juveniles over time, so abundance, breeding success and survival can all be measured, making this one of the most valuable ringing projects. Target species include many of our long-distance migrants (e.g. Reed Warbler, Sedge Warbler, Garden Warbler, Whitethroat, Willow Warbler) plus resident scrub species such as Wren, Dunnock, Blackbird and Robin. 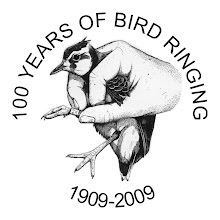 The CES scheme started in 1983, so ringers have just completed the 29th season and will soon be focussing their attention on getting all their data to BTO HQ ready for analysis. The results of the most recent CES analysis can be found on the species pages here and the preliminary results from 2011 will be available later in the autumn. These will provide the first indications of abundance and breeding success of birds nesting this summer, helping to assess the potential impact of yet another harsh winter. Early indications suggest that a number of migrant species have returned in greater than usual numbers. However, despite an early start to the breeding for many species, prolonged periods of cool and wet weather, particularly in the north and west of Britain and Ireland, were associated reduced breeding productivity levels. A big thank you to everyone whole has help with CES this year and those ringers who have already submitted their data. Thanks to Dorian Moss for the above picture of Lucy Yates and Kate Risely for the top picture of Nick Moran. What happened to the recoveries?